Do you enjoy calling people to take an over-the-phone survey? Are you interested in politics and political surveys? Can you commit to a 20-hour workweek? Then Oasis Marketing Solutions might be the place for you. What Exactly is Oasis Marketing Solutions? Oasis Marketing Solutions is a marketing company which offers lead generation services, data mining, appointment setting, and political surveys and polling. 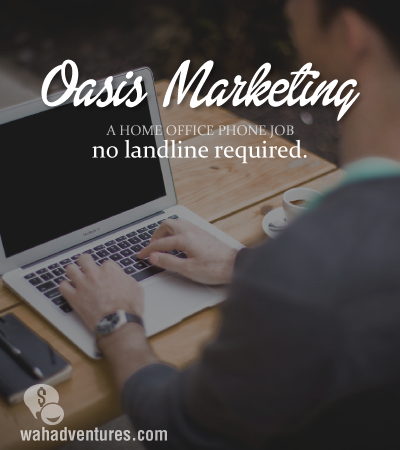 Oasis Marketing Solutions has a Tampa call center and Houston call center as well as many independent contractors working from their own home offices. As you might imagine, for this article we will be discussing the home-based positions available for Oasis Marketing Solutions. What Do Remote Agents Do at Oasis Marketing Solutions? Using the Oasis Marketing Solution’s Five9 telephone system, you would be making/receiving inbound and outbound calls. The good news is you don’t even need a landline phone to work there, since you will be calling through your PC or laptop. You will, however, need to supply your own USB headset and mic. Oasis prides itself on being able to match the needs of the client to just the right remote calling agent. Most of the remote agents either do outbound political calling or work on a core project using other administrative skills. What Are the Equipment/Computer Requirements? an updated PC or laptop with high-speed Internet. anti-virus and anti-malware software installed. a USB headset and mic. What Are the Other Qualifications Will You Need to Be Considered? sales experience and a proven track record. a commitment to a 15 to 20-hour workweek. What Are the Workday and Schedules Like at Oasis Marketing Solutions? As an agent, you will be emailed the available shifts. Most shifts are 4 to 5 hours long and you will need to grab them as available and sign up. Hours are generally “office hours” in the time zone you are working, which can work out to 8:00 a.m. to 8:00 p.m. if you are on the East Coast of the United States. This company only hires in the United States due in part to the political nature of the work. You are an independent contractor responsible for your own taxes. Should you make over $600 a year, you will be sent a 1099 Tax Form. What is the Pay Like and When is Pay Day? Payment is between $9 to $10 an hour depending upon whether you are working the political surveys or a core project. Payment is once a week via PayPal. So you will need a PayPal account if you don’t already have one set up. What is My Overall Impression of Oasis Marketing Solutions? payment is always on time. it is hard to get the minimum amount of hours. the website says a 15-hour minimum while it is more like a 20-hour minimum. it is hard to get hours without stalking. the work is boring and repetitive. There is a review mentioned on Glassdoor as well as discussions on several work-at-home forums. How Can Someone Interested Apply to Oasis Marketing Solutions? Interested individuals may submit resumes to info@OasisMarketingSolutions.com. If selected, you will receive an email to set up a brief interview as well as a few assessments for you to complete. There is also a brief training after the assessments. Good luck to all who apply! Leisa Good is the owner of GBS Virtual Office Solutions and a PFYP certified career coach at Powerfully Purposed For Success. Her coaching specialties include entrepreneurs, small businesses, and work-at-homers who have become "stuck" and really need to find their true calling. She just loves it when folks contact her to pick her brain or join in the lively conversations. Perfect review. I’ve been working for these people for a short while, and you got it all in a nutshell. I’ve only been working on the political calling, so I can’t speak to what happens in the “core” programs area. The stalking hours thing is so atrocious it’s almost a joke if it weren’t so annoying. Hours are usually published on the day they are available, often with only a few hours notice (1 or 2 or 3), so you effectively have to be “on call” all of the time, available to work whatever you can get yours hands on at a moment’s notice. This seems to be ok for some people, but if you have other jobs, or other responsibilities – basically, if you have a life beyond Oasis – .the chaos gets very old, very fast. It is typical for published shifts (which you sign up for via an internet-based scheduler) to disappear within SECONDS of their publication. There are individuals who are “stalking” with iPhones who have these problems. The supervisors are, as you say, very nice. BUT – A lot of the work is so boring you want to shoot yourself in the head after an hour or two of it. On one call we were just repeating the same paragraph to either a person who answered the phone, or an answering machine, and I counted – it was about 84 times per hour. I guess some people like it, they consider it easy (and it is), but I prefer a more complex job just to keep my mind engaged over the hours so I don’t go crazy. One note – there are two ways to get paid, if you want your money immediately, you can get it through PayPal, and of course pay the fee there. Or you can just wait, and they will send a check in the mail. For some reason that seems to take a lot of time, almost a week, but it avoids the service charge. No direct deposit available to your bank account. @Diane Martin – Wow! Thanks, Diane. There’s nothing like comments from a veteran! Paypal is not in my country and check don’t reach by our local post office. Can they send check by fedex or other reliable service. @bili – not sure on that one, but you can always send them an email and ask. I wanted to know if you have to stalk the scheduler in order to receive hours are you always able to make your 20 hours a week? I have received the email with my assessment tests but have not completed them yet because I’m trying to get more information on this company before investing time in the assessments and then possibly not getting hours to work for the week(s). Thanks in advance. I would encourage you to work.. You will love the pay. Yes I must say when they are busy there is a enough work for everyone.. As of now it’s very busy and plenty incentive to be made, I am not sure if they are currently hiring since we are max out agent most days. But you can always reapply around April for polling survey they also have a core program 10.00 hr that you inquirer about as well. What i like about this company is that the staff leader are awesome and they are very friendly and professional way better than any other company for sure and i been around for years.. NO stress, no quota, no negative feedback easy peasy money and most of all they encourage you to make money. I average 50-60 hours every 2 weeks when we are busy and pay is always on time… I give this company 5 stars because they are such professional people and I love working for oms and so as many of my friends.. Last day for survey polling is NOV 4th season will be slow after that date.. Good luck !!! and keep trying it’s worth it!!! @Tanyon – sounds like one of the better places to work. Thanks for sharing. Is this hard work you believe leisa? I have heard from the comments here and other places that it is easy just reading a script i guess even in a answer machine person etc? I would imagine most people would just hangup alot of hangups you think? But you still get paid for answer machines hourly rate? And if a person is interested after reading from a script do you then ask them questions and you fill it in a computer program there responses back or something? I sometimes have hard time hearing people with accents so it might be a challenge for me. I hope though I will hear back from them. I did not see them hiring for this position on there site it just said customer service and sales it seems. But i sent it in anyway.